Nashua’s Solutions Lab was celebrated for its innovation and outstanding industry contribution at the fourth annual New Generation Social and Digital Media Awards on 13 October where the inspiring business think-tank walked away with four awards. The result of a working collaboration between Brand inc, G&G, Tag 8 and Nashua, The Solutions Lab was the overall winner in the Online Strategy of the Year and Digital Brand of the Year categories, as well as being awarded Gold for Blogging Excellence and Bronze for Excellence in Content Marketing. The Solutions Lab was born out of the desire to position Nashua as a thought leader, B2B trailblazer and industry driver. As Nashua’s marketing partner for over a decade, Brand inc conceptualised and strategised the idea for a content marketing platform to drive brand image and engagement. Nashua bought into the idea and utilised its digital agency, G&G, for implementation and Tag 8 for media planning. Part of Nashua’s Real People, Real Solutions campaign, The Solutions Lab operates as a hub for all stakeholders, customers, potential customers and people in the industry to engage with insightful and impactful content from prominent South Africans, and in the process positions Nashua as a thought leader in business solutions. “The Solutions Lab is an innovative space that is not without its challenges,” adds Clarivette. “Sometimes it can feel like there is a disconnect between presenting content and how it converts into sales, especially in the sales driven environment that Nashua lives in. Plus any content platform has to work hard to stay fresh and relevant. 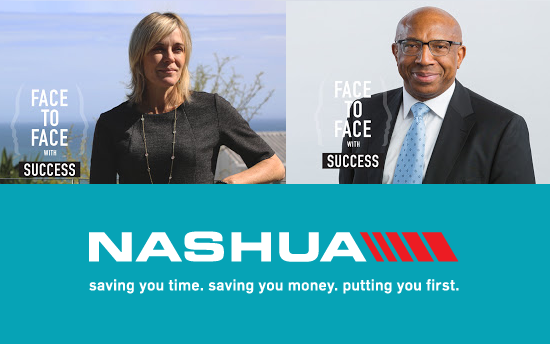 To further bring in a human appeal to typically emotionless business content, Nashua partnered with Primedia to create Face To Face with Success. These bite-sized podcast interviews with interesting South Africans give direct examples of engagement with innovation, all living within the Solutions Lab platform. “These podcasts unpack how individuals, including the likes of Thuli Madonsela, overcame obstacles in their lives and careers to reach success,” says Tag 8 media strategist, Marguerite du Preez. A fresh interview is loaded weekly and publicised across KFM, CapeTalk, 947 and 702, driving listeners to The Solutions Lab website. The first thirteen weeks of the campaign received close to 80-million impressions across all media channels. Primedia Cape Town general manager, Karl Gostner adds: “Primedia Broadcasting has made substantial investments in its capacity to create and distribute compelling digital content. It has been a privilege to partner with a client like Nashua who is equally committed to innovation in digital media and marketing. The New Generation Awards attracts some of the brightest and boldest in the industry and gives South Africa’s leading and much loved brands recognition for the work they do. The Solutions Lab’s content marketing strategy contributes to Nashua fulfilling its objectives of owning its status as a thought leader in its industry. “The strategy has helped to take the brand to the next level and we are proud to have been part of the marketing team,” concludes Clarivette.